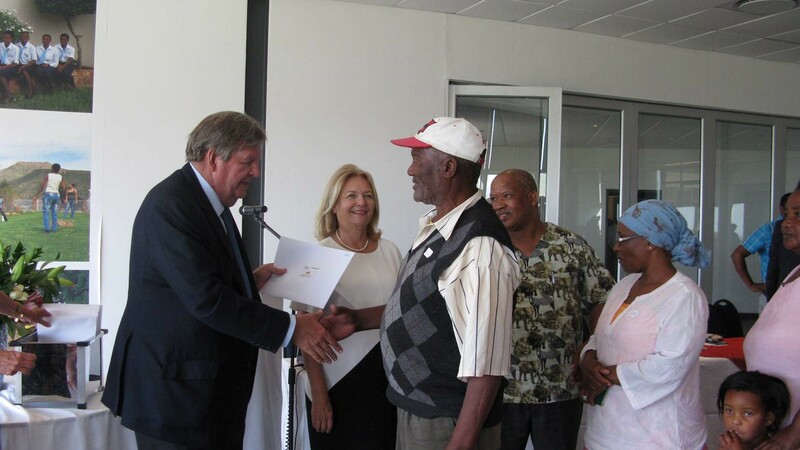 On 16 November, 70 residents of the Karoo town of Aberdeen walked into the presentation hall as tenants and out as home owners, with full freehold title made possible by the generosity of businessman Johann Rupert and his wife Gaynor who are significant sponsors of the Free Market Foundation’s (FMF) Khaya Lam (My Home) Land Reform Project. Khaya Lam delivers the real economic empowerment of home ownership to township residents, deprived of their dignity and rights under apartheid, by facilitating the conversion of council owned rental properties into freehold title - at no cost to the recipients. For more than 40 years the FMF has championed the cause of converting the numerous forms of Apartheid title found in the townships to full, unambiguous ownership for the current tenants. 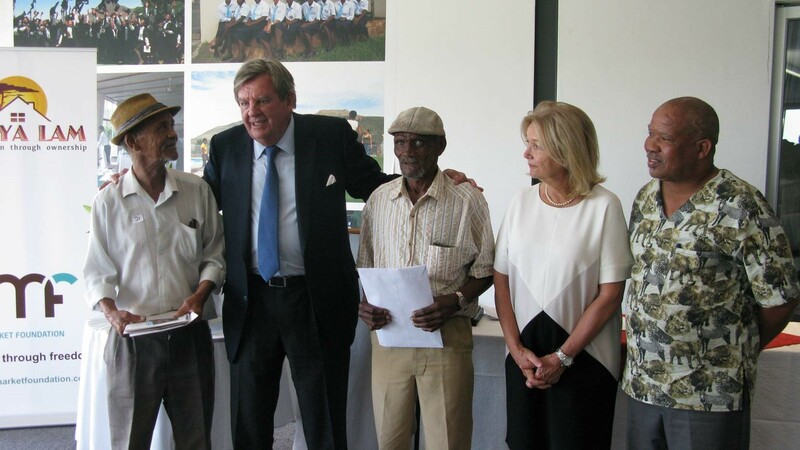 Before personally handing the title deed certificates to recipients, Johann Rupert said the people of the Karroo were a “special breed” and spoke about how poor both his mother and father were as “children of the depression”, and had never let him forget his origins. Anton Rupert, his father, used to remind him that this region produced the Rev Beyers Naude, Robert Sobukwe and the Cradock 4. He said they had a special bond with Aberdeen (all recipients were from Aberdeen) because it was Gaynor’s home town. Her father was a master-builder and built the magnificent church in the centre of Aberdeen. When introducing Johann Rupert, council Speaker Tembisa Nonnies talked about the care and concern to “give back to the people” shown by the Ruperts. “Ek het evidence! 24 schools in the area have computers and internet. Nobody goes to school hungry. The pupils might arrive hungry but they get a nourishing porridge every morning. (At) 7 o’clock every morning there are ladies who start cooking the porridge, thanks to the Ruperts,” she said. There were moving speeches by the Mayor Deon de Vos and an Aberdeen title deed recipient. Master of ceremonies was Clr Willem Safers. The event took place in Rupert’s birth town of Graaff Reinet at the South African College of Tourism (SACT) which was founded and is funded by Gaynor Rupert. The presentation of title deeds followed a graduation ceremony of 92 hospitality students from disadvantaged backgrounds who will go on to forge careers in the tourism industry, supported and guided by the College. On 3 December, in Stellenbosch, Johann and Gaynor Rupert will present more than 326 title deeds that they have sponsored to the ‘new’ home owners. Media are invited. Titling in South Africa is a painstaking process complicated by lack of records of ownership and bureaucratic complexity. Each area has its own issues and complications. It takes time and commitment to work through individual difficulties to eventually be able to present the right title deed to the right recipient. It requires sponsors like the Ruperts who are willing to fund this process. Titling is particularly complicated in the Aberdeen and Graaff Reinet areas. The 1913 Natives Land Act prohibited black South Africans from owning land in so-called ‘white areas’ – restricting the question of land ownership entirely to the ethnic authorities in the reserves, later known as homelands. Black people in the cities thus lived as tenants on property owned by the local municipality, which developed into what we know today as ‘townships’. Not much has changed and as many as 5 million families still live as tenants or without ownership rights across SA. Khaya Lam offers hope to these citizens 20 years after the end of apartheid.